There are hot water bottles for those chilly nights. You are more than welcome to bring your own Sky decoder. For our overseas visitors: We offer a linen service for a $80.00 per stay charge. This is required to be paid in full with the deposit and is non refundable. You will be given instructions to where the linen is kept and on leaving we will change the linen and remake the beds. Under Kiwi Bach tradition, you are expected to clean the house, follow the house rules, and do the dishes before you leave. Has stairs to upstairs bedrooms, small children will have to be watched. Walking distance to restaurants and bars. 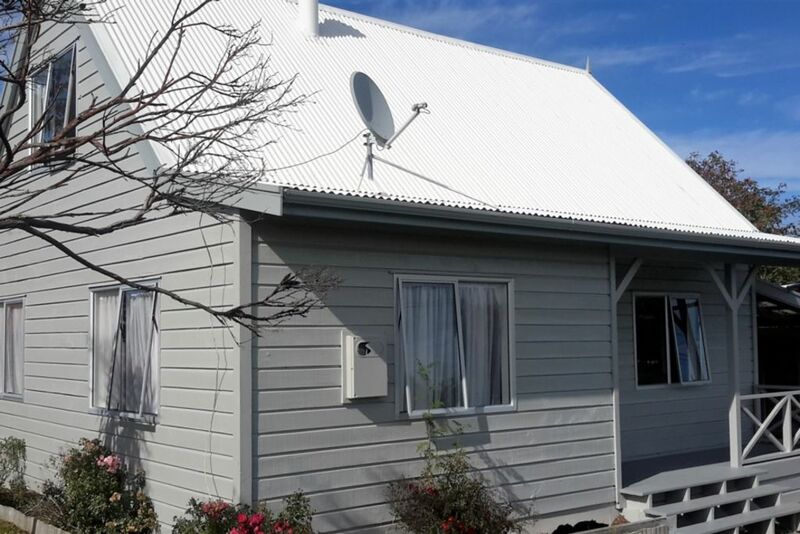 Less than 5 minutes walk to the shuttle Park and Ride to Whakapapa Ski Fields. We also recommend the service of Ruapehu Scenic Shuttle www.scenicshuttles.co.nz for all your transport solutions to the Ski Fields, Tongariro Crossing, 42 Traverse and much more. Nepresso Coffee Machine bring your own capsules. Welcome to bring your own Sky Decoder. Great place that is central to anything you want to do in National Park. Owners respond quickly and are good to deal with. Great location for kids with a playground just down the road and a beautiful view of the mountains. Highly recommend it to all. We found we had to wash every kitchen utensil we used. Spoons still with food on them , some coffee mugs unwashed with coffee inside and 2 bowls and spoons sitting on the sink in a puddle of water. A collection of dead flies and moths in the bedrooms. New bathroom and toilet very clean and tidy. First rented bach I've taken my recent overseas visitors to. They were shocked at cleanliness. I am a Kiwi who has rented before in NZ and around the world. This is the first negative review I've ever written. Love the new table, duvets and oven. We always enjoy staying here and highly recommend it to anyone who is after a comfortable place to stay. We were warned that the house may smell a little smokey as there had been an incident with a previous tenant. It didn't. Maree had warned us, been down and aired the house and done her best to make it great for us. It was a fab little place to stay, took a little while to heat the downstair room, but clean and tidy. We'll be back (in a few weeks in fact).